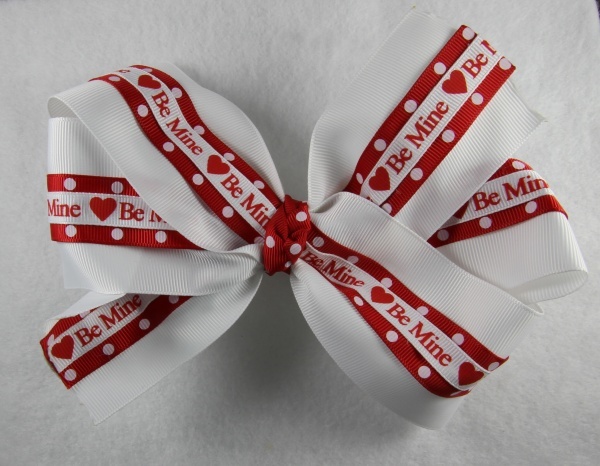 Double the love with this double layer Valentine BE MINE bow. This has a white 2.25" base bottom, then a 7/8" red with white polka dots in the middle and topped with a 3/8" white with red "Be Mine" grosgrain ribbon. There is red hearts and white polka dots that run through this ribbon. Your little sweetheart will show off her love with this red and white "Be Mine" Happy Valentine's Bow!